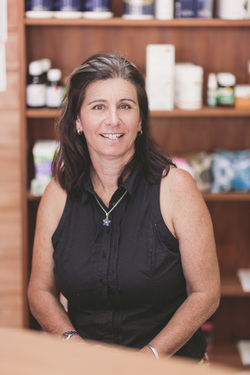 ​​Judith Danks brings over 12 years of clinical practice to her business as a Naturopath and Medical Herbalist in Matamata. She is the founder of a private practice located in The Kaimai Natural Health Centre in Matamata which she launched in 2009. She services the wider Waikato and surrounding districts with her holistic treatments and modalities, treating all ages, from babies to the elderly. Of particular interest to Judith, are Women’s Hormonal Health and Preconception Health issues. With a Diploma of Naturopathy and Diploma of Medical Herbalism, and a Post Grad Certificate in Fertility and Reproductive Health, she pursues a holistic approach to women’s health concerns. She has also undertaken Post Grad courses in Advanced Certificate in Fertility and Reproductive Health, and also pregnancy Health. She also has a special interest in Chronic Fatigue and childhood health concerns and allergies. In 2016 she completed a Diploma in Hypnotherapy. Judith has served thousands of clients throughout her career, and continues to engage many clients each month in helping them achieve a greater level of health, and wellness. She is also a member of the Naturopaths of New Zealand and the New Zealand Association of Medical Herbalist, and a member of the New Zealand Health Council. Judith is a mum to 3 grown up children and her and her husband live on a live style block in the heart of the Waikato. One of her all time interests is growing her own food and cooking healthy meals. She is totally passionate about New Zealand and its Natural Environment, and loves getting out in it, biking, tramping, fishing and swimming. Yoga, meditation and palates are also interests. Judith Danks provides holistic treatments that cut to the core of physical, emotional, and spiritual issues. By taking a comprehensive approach to health and treatment, she provides real results for her clients. Hypnotherapy- Judith uses this to assist in the facilitation of changing old patterns of behaviour to new affective ones that bring about positive health and wellness for patients. Hypnotherapy can help with: Weight issues, motivation, smoking, menopause, sleep, confidence and self-esteem, stress and anxiety, Habits, addictions, phobias, pain and much more. In addition to offering her own expertise and treatments, she also works with Osteopaths, counsellors, massage therapists, physical trainers, and life coaches so as to offer her clients holistic treatment that works. Her personal work includes servicing the surrounding areas and also offering one-on-one skype consultations. If you are seeking health treatments that go beyond the surface, then Judith Danks is the perfect person for you to work with. As a Naturopath, Medical herbalist and Hypnotherapist in Waikato, she is able to deliver a truly comprehensive and holistic treatment. Her work as a Naturopath in Waikato has enabled many clients throughout the Waikato region to feel better about themselves and live healthier. For a holistic approach to your health, consider working with Judith Danks.